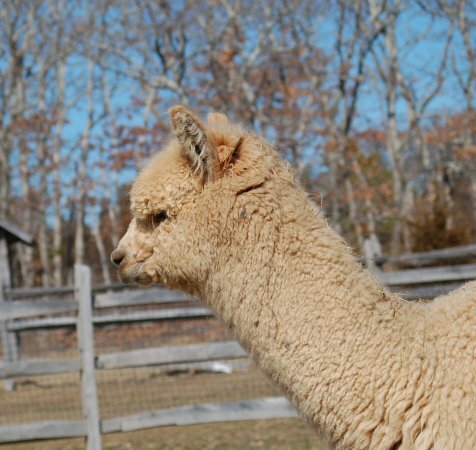 Profile: look at that fleece! Khan d'Or on the loose! 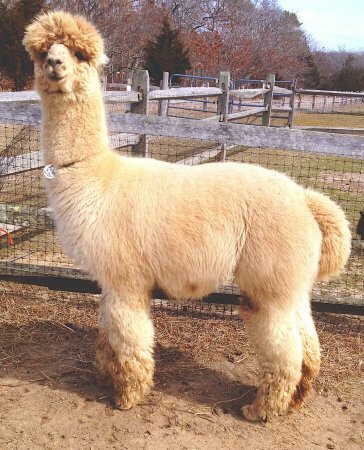 Khan D'Or wins second at the Virginia Classic Alpaca Show in 2009! Khan D'Or is truly a "golden-boy" as his nickname implies, he is the closest we have seen to a literal golden fleece. Super lustrous he has revealed a micron of 16.7. This in fact should be no surprise, as his lineage speaks for itself. His mother, Golden Frida, is the daughter of the famous Snowmass Legacy Gold. Frida has very correct conformation, as Khan D'Or does, and she is a large boned female who had Khan D'Or entering the world at over twenty pounds! Hands on the "Gold" you will find evidence of the quality she has produced in this amazing male. Khan is also a fiber producing machine! 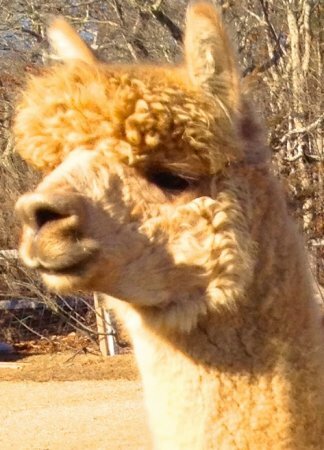 In 2013 he sheared off 10.8 pounds of fleece. Khan D'Or's Sire, Aga Khan has won 11 championships over a 4-year show period before being retired from the ring in 2006. 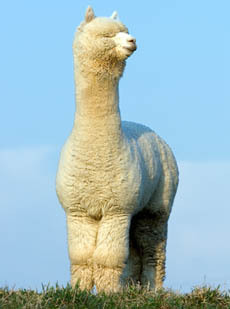 In 2007, his crias began claiming their banners and winning for Khan, five first place Get-of-Sire wins so far with many, many shows still to go. His value has continued to increase, actually greatly increase over the last four years. With the performance of his crias in the show ring, many breeders have gained even more of a serious respect for him, as you will have with Khan D'Or. 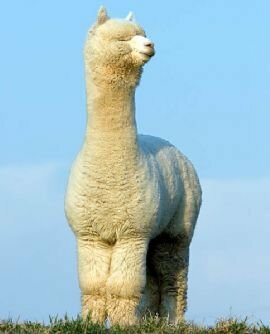 Khan D'Or is quite large for an alpaca, but he has a heart of gold! 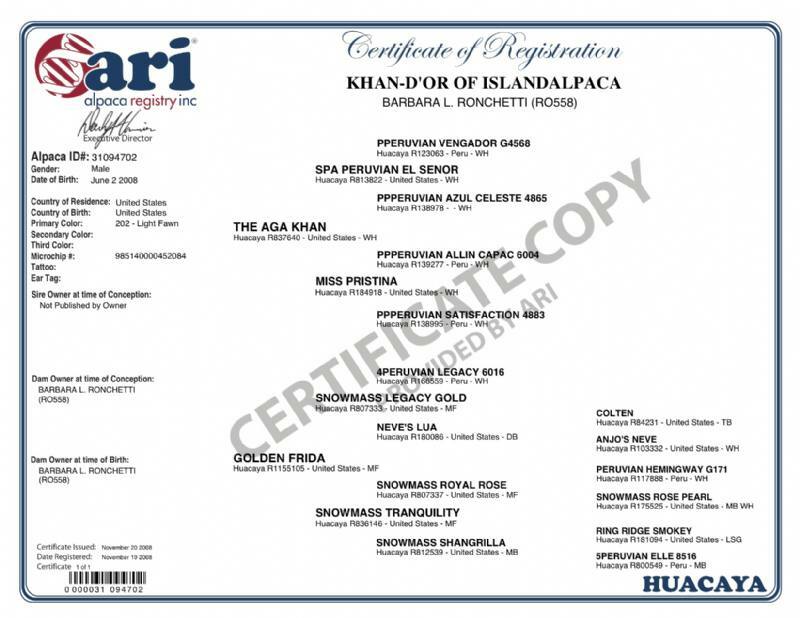 Put this wonderful genetic line in your herd, with Khan D'Or. (Aga Khan now resides in Florida). 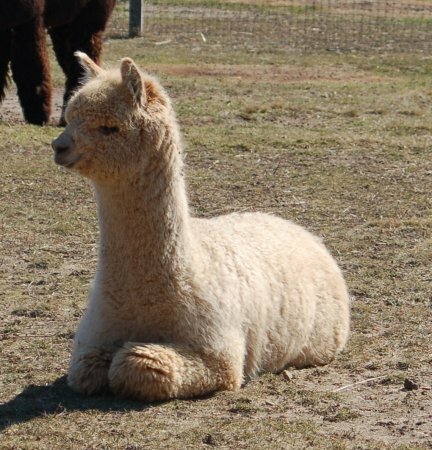 Sheared off 10.8 pounds of fleece in 2013! The Aga Khan's great-grand sire on both sides is the Peruvian Shere Khan. His grand sire is Vengador. He has won 11 championships in total as well as five Get-of-Sires! The Aga Khan sold for $217,000 at the 2008 Futurity Sale. 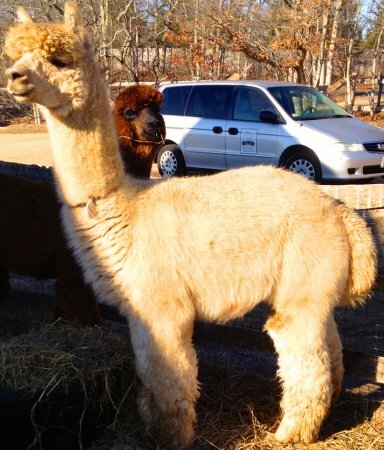 He was owned by Golden Spirit Alpaca Ranch, and had a Stud Fee of $7,500!
" 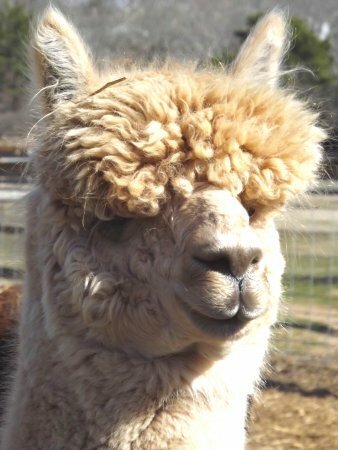 1st Place, GET OF SIRE, 2008 Carolina Alpaca Celebration. Judges: Jude Anderson and Tim Lavan. 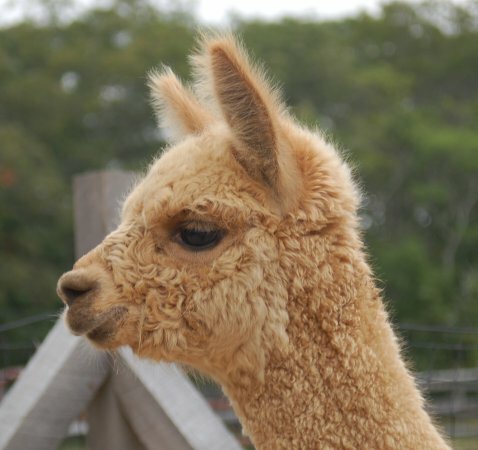 Ã‚¨ 1st Place, GET OF SIRE, 2008 Sunshine State Alpaca Expo. Judges: Julio Sumar and Wade Gease. 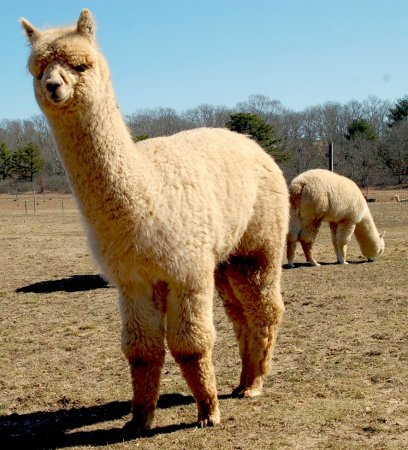 Ã‚¨ 1st Place, GET OF SIRE, 2007 NY Empire Alpaca Extravaganza. Judge: Amanda VandenBosch. Ã‚¨ 1st Place, GET OF SIRE, 2007 Big E. Group size: 5 sires. Judges: David Barboza & Wade Gease. Ã‚¨ 2nd Place & Reserve Color Champion, 2006 PAOBA Breeder’s Showcase (Judge: Jude Anderson & Jill MacLeod). Remaining championship quality at nearly 4 years of age! 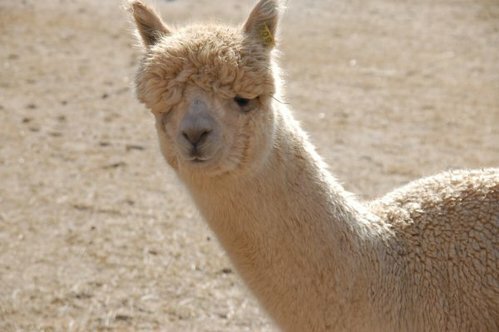 Ã‚¨ 1st Place & Color Champion, 2006 Maryland Alpaca Show (Group size: 50, Judge: Jill MacLeod). Also, 1st Place Fleece Show with a score of 81 for his fleece shorn at 3 years, 10 months of age. Ã‚¨ 1st Place & Color Champion, 2005 Buckeye Alpaca Show (62, Shannon McConnell). Also, member of Doug's 1st Place winning “Dream Team”. 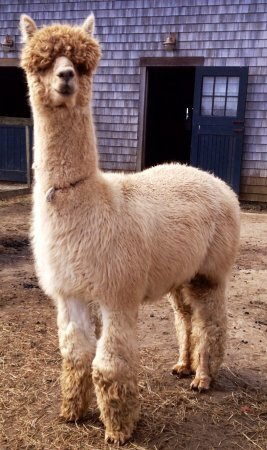 Ã‚¨ 1st Place & Color Champion, 2004 Empire Alpaca Extravaganza (68, Kristen Buhrmann). Ã‚¨ 1st Place & Reserve Color Champion, 2004 New England Coastal Classic (44, Mike Safley). 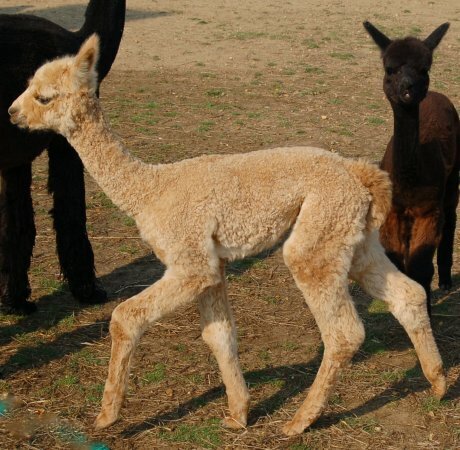 The champion and reserve champion were then reversed at the following show (2004 Empire Alpaca Extravaganza) with Khan standing as color champion.